I haven’t been able to locate anything about this structure but will update when I do. 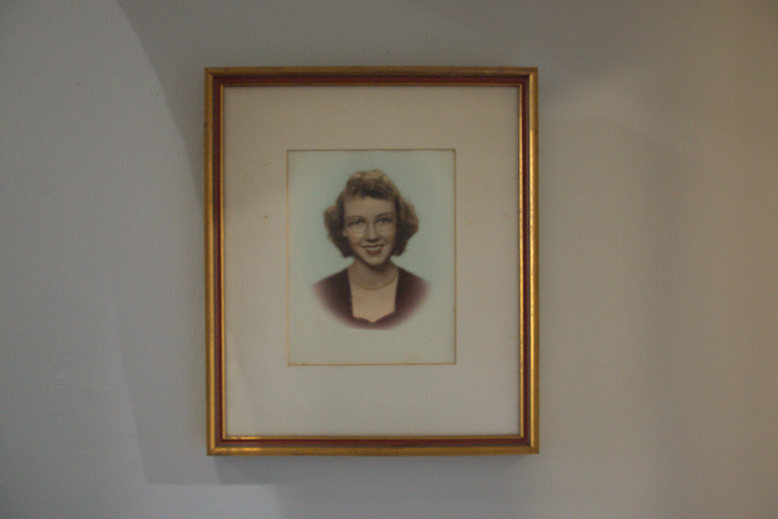 After being diagnosed with lupus in 1951, famed American author Flannery O’Connor came to Andalusia to be cared for by her widowed mother, Regina Cline O’Connor. [While a student at Georgia College, I lived on the top floor of Ennis Hall for a year. 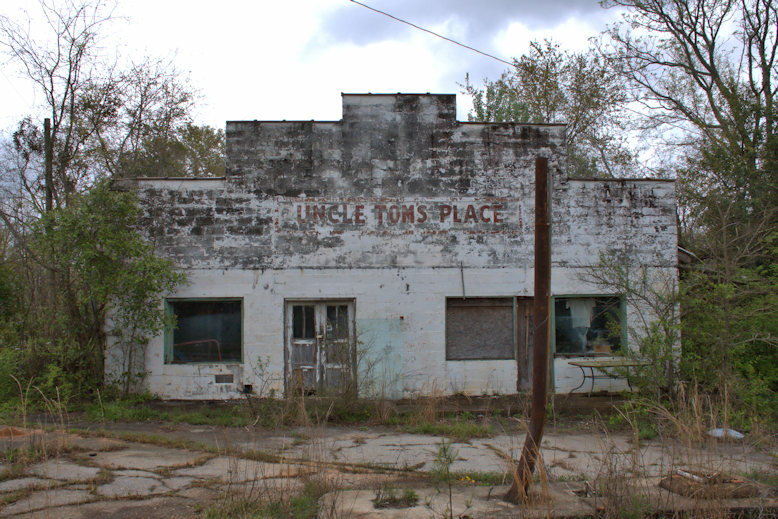 It was located around the corner from the then derelict Cline-O’Connor mansion where Regina lived out her last days. One of my most vivid memories was seeing Mrs. O’Connor through a window in silhouette. She was a very private person.] Most of Flannery’s best-known work was written here. 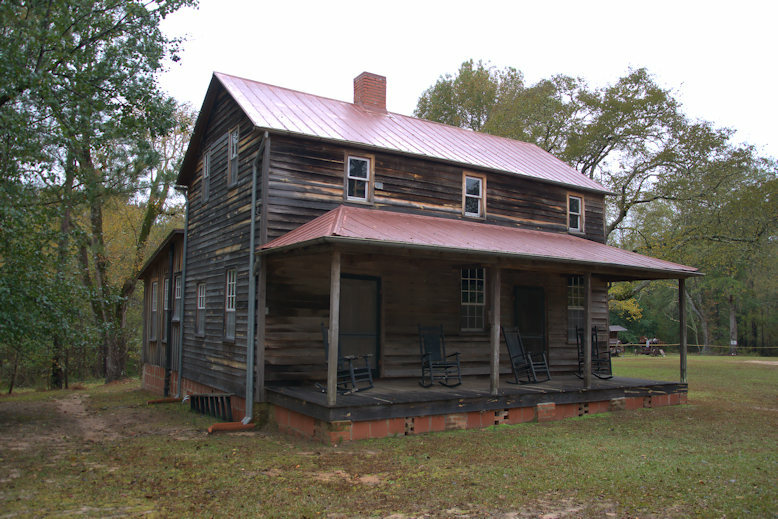 The property that became Andalusia was first occupied as a cotton plantation in 1814. 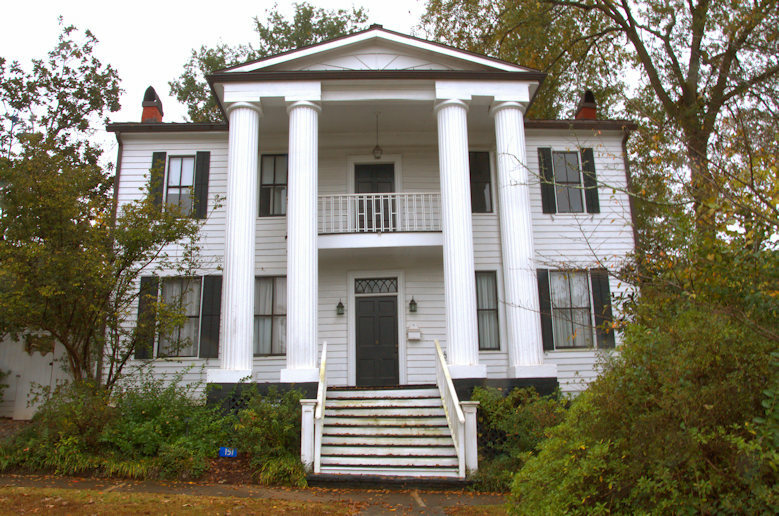 The main house, seen above, was built in the 1850s. 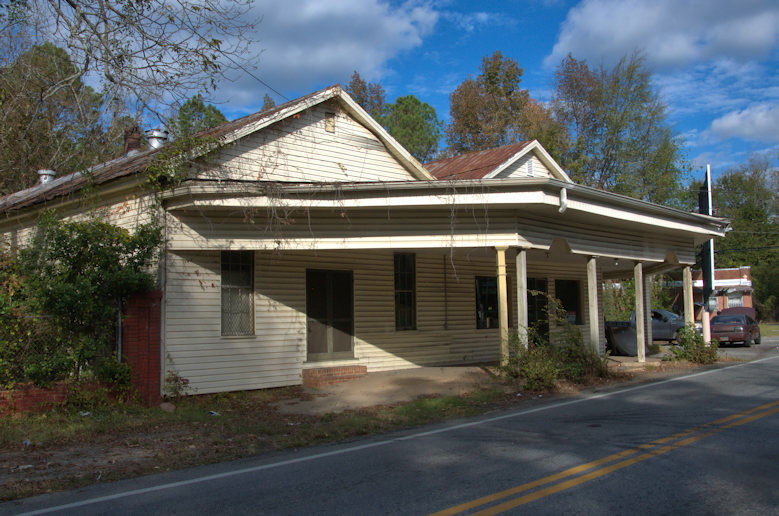 It was purchased by Flannery’s uncle, Dr. Bernard Cline, in 1931. 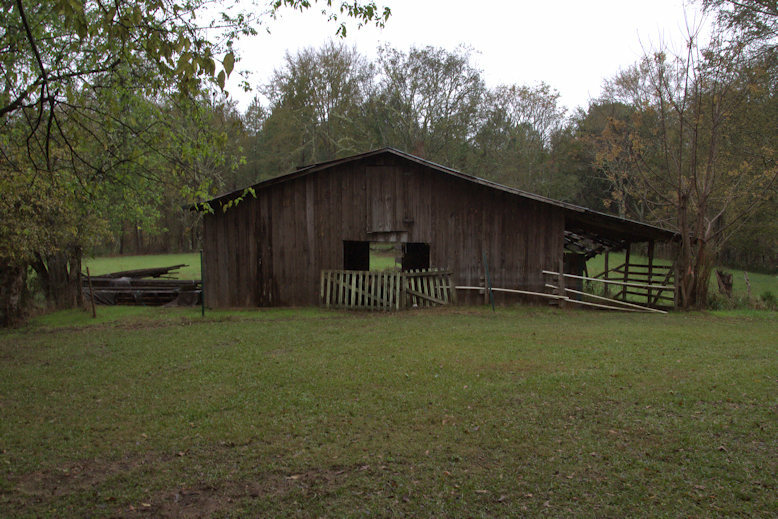 During the Cline and O’Connor residencies, the 500+ acre property served as a working dairy and beef cattle farm. 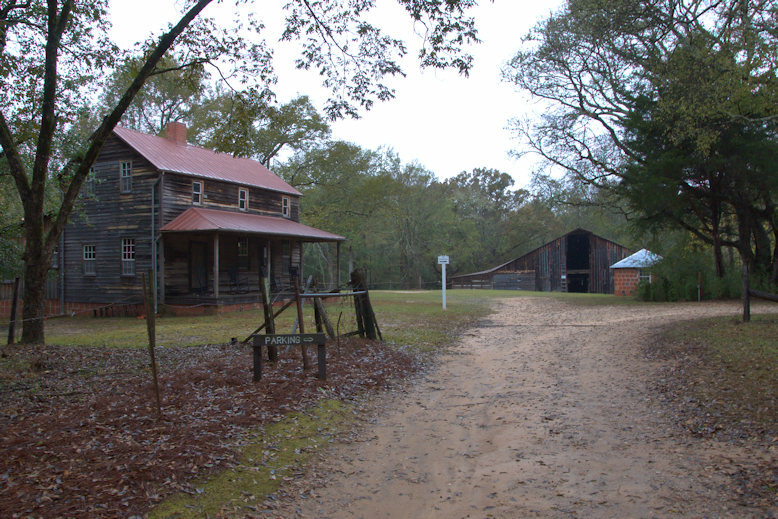 After Flannery’s death in 1964, the farm remained with the family until 2003, when it was donated to a private group for preservation. 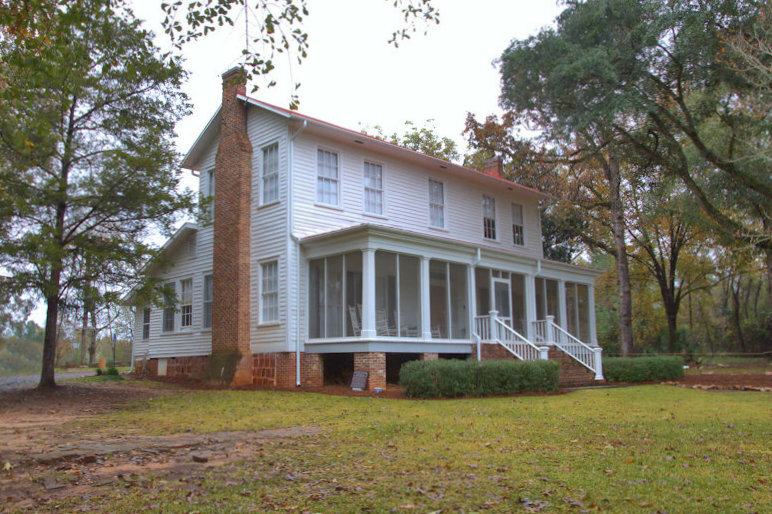 It was gifted to Georgia College in 2017, which now operates it as an historic house museum focused on interpreting the time Ms. O’Connor spent at the property. 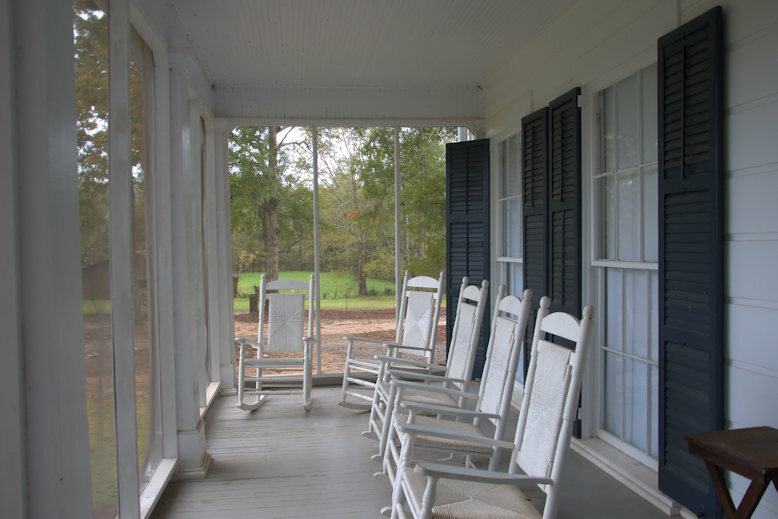 Dr. Cline added the screened-in front porch during the 1930s. 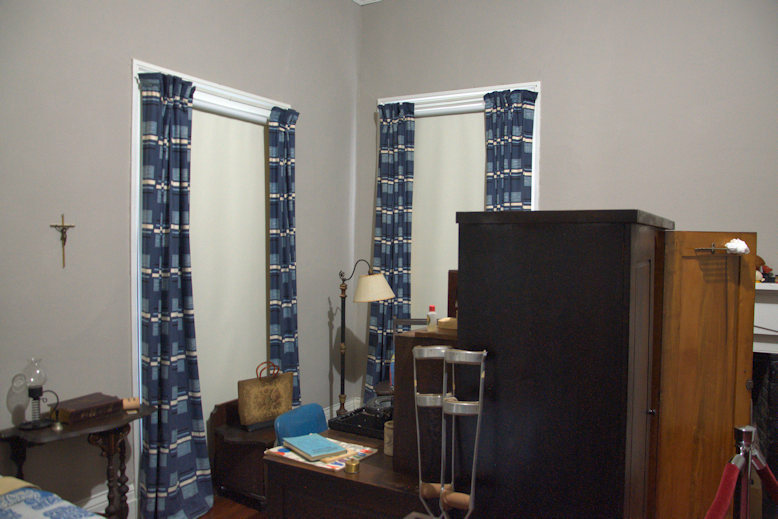 The interior remains largely the same as it was during Flannery O’Connor’s residency here. Georgia College is doing an excellent job not only of preserving but interpreting these items in proper context. 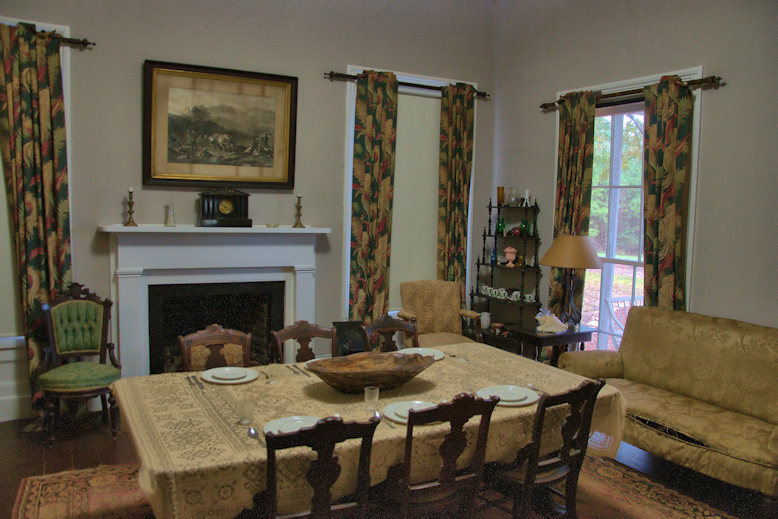 The dining room doubled as a parlor and is the most visually interesting space in the house. 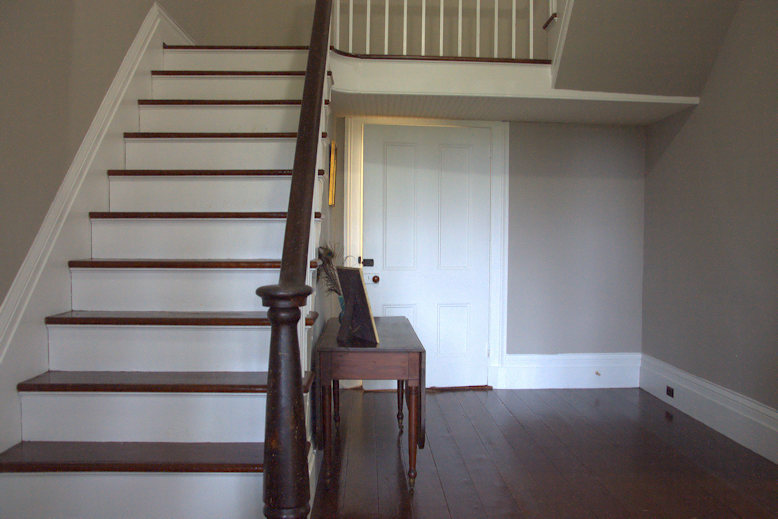 The stairwell is the most impressive feature of the foyer, though the upstairs rooms are not accessible to the public. 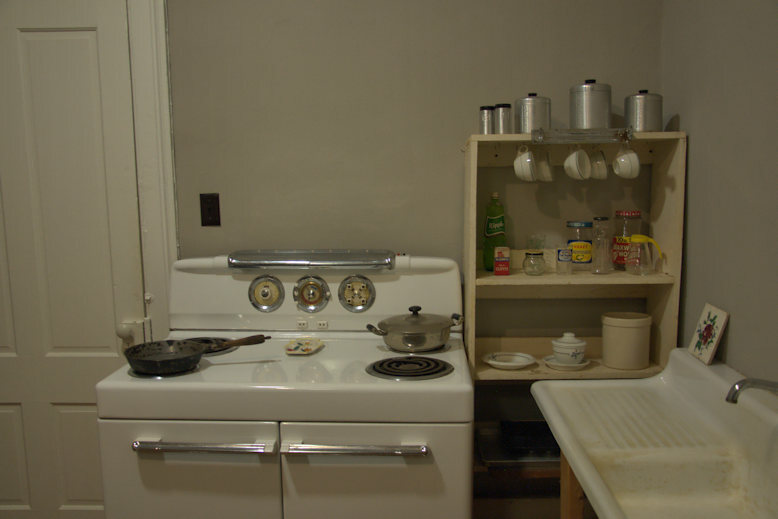 They were used only for guests of the O’Connor family and storage. 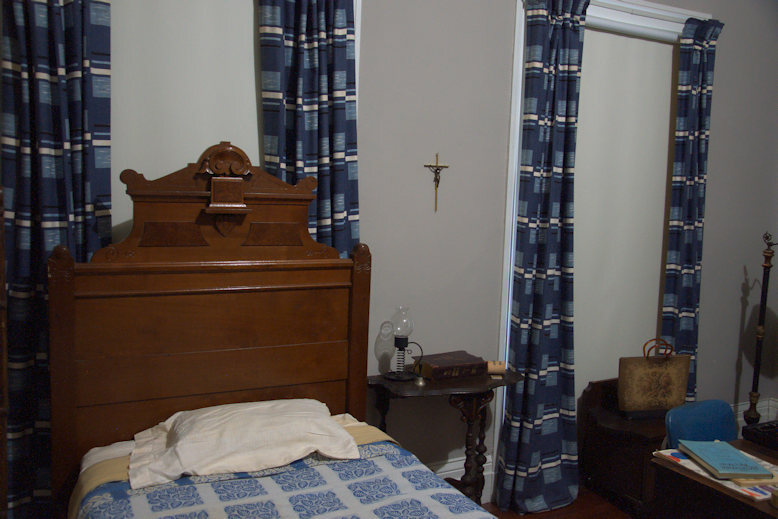 Flannery’s bedroom is a large space at the western front of the house. Braces, which she needed to get around as her lupus became more debilitating, are a stark reminder of the pain Flannery often endured. Flannery spent many hours convalescing in this small bed. 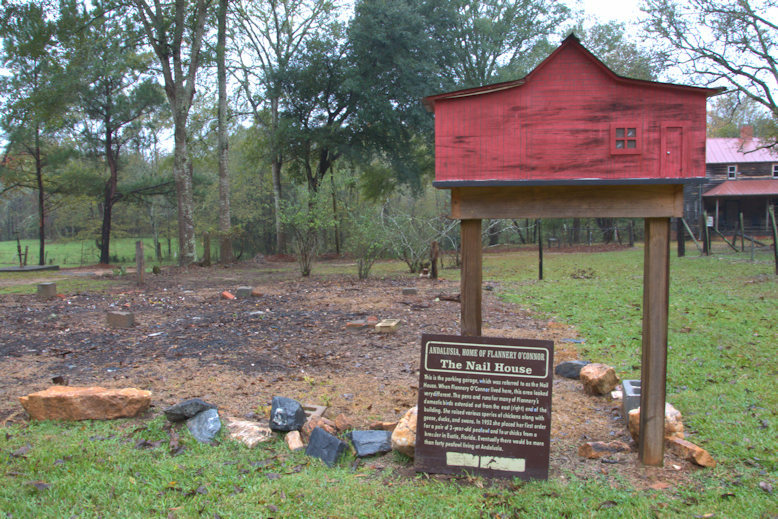 The well house was built over a hand-dug brick-lined well. 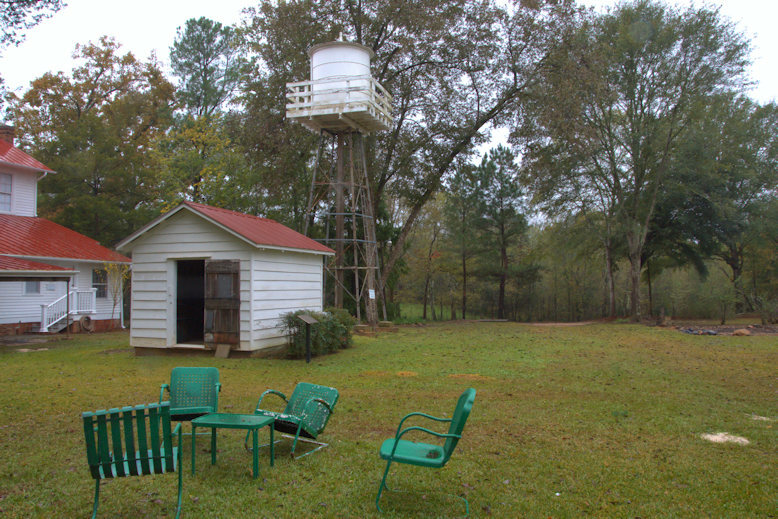 The farm was electrified in the 1940s and Regina had the water tower built in 1956. It’s 32 feet high and holds 22,000 gallons. Away from the main house are numerous outbuildings which contributed to the productivity of the farm. 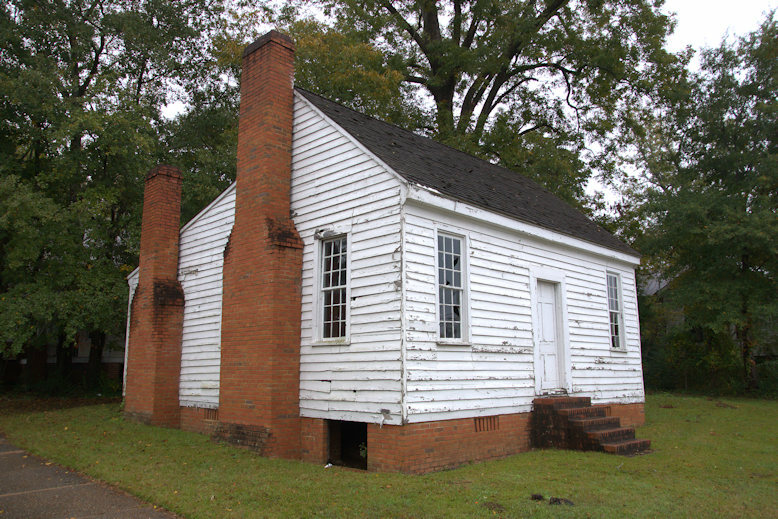 They’re presently in various states of preservation, with eventual restoration the goal of Georgia College. 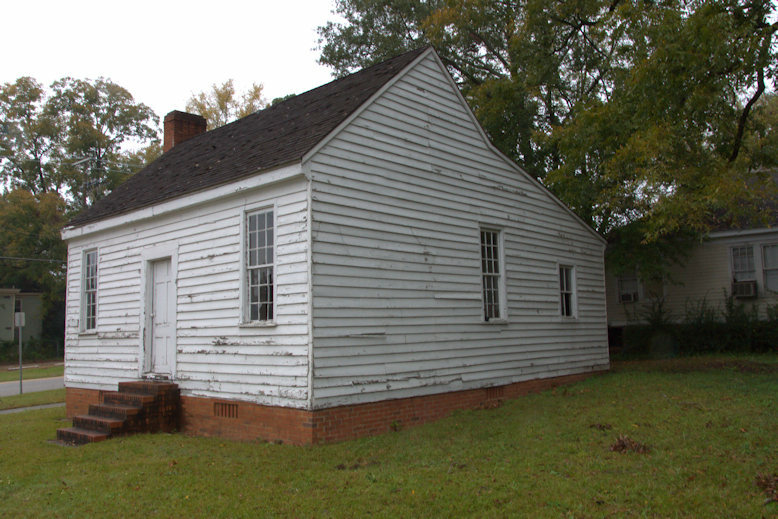 The most prominent structure, now located just northwest of the main house, is thought to be the original house of the plantation which became Andalusia. It was located nearer the main house but was moved to its present location in the late 1940s or 1950s. Several smaller tenant houses are located south of the main house but are in ruins or terrible condition. I did not photograph them. 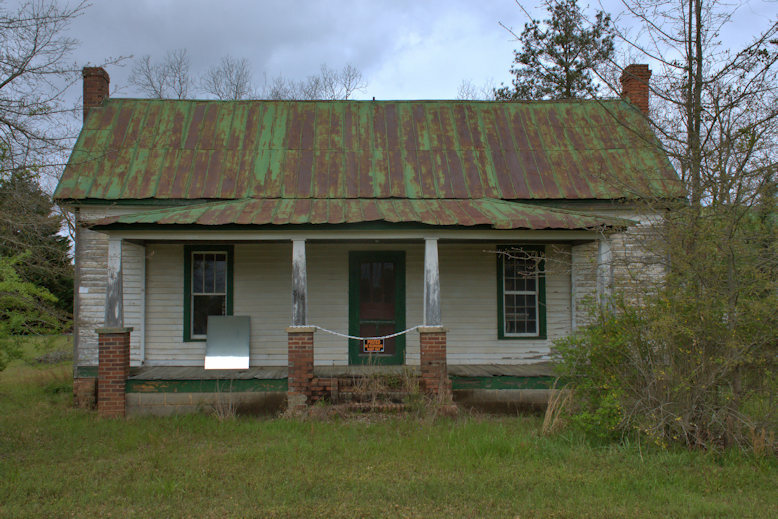 Robert Jack & Louise Hill, who were tenant farmers during most of Flannery O’Connor’s time at Andalusia, lived here. [Photo Courtesy Andalusia]. 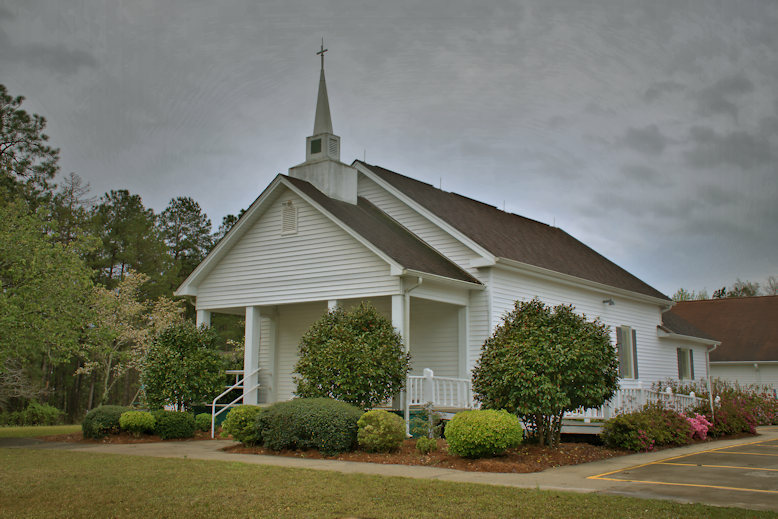 A dairy was established at Andalusia in 1947 by Regina and brother Louis Cline. 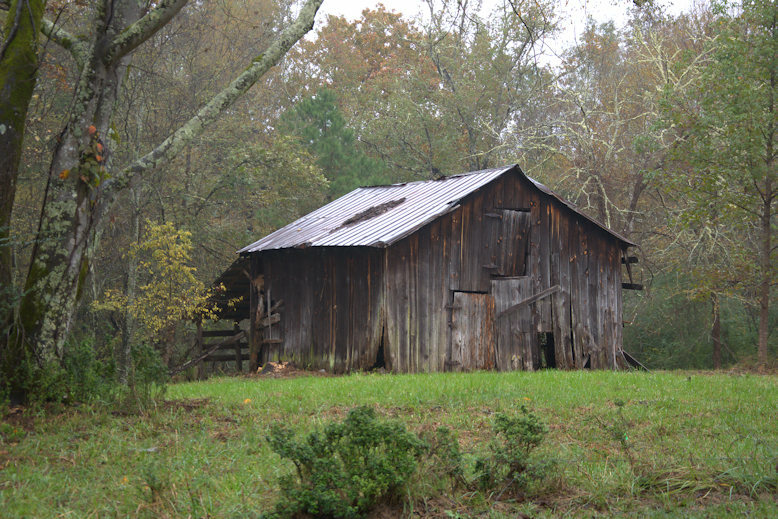 The barn figures centrally in Flannery O’Connor’s beloved 1955 story, “Good Country People”. Andalusia’s milk was processed offsite in Eatonton. This shed, likely built in the late 1940s, kept it cool until transport and was also used to sterilize the cans. The calf barn was used to segregate male calves from their mothers so they could be fed powdered milk. 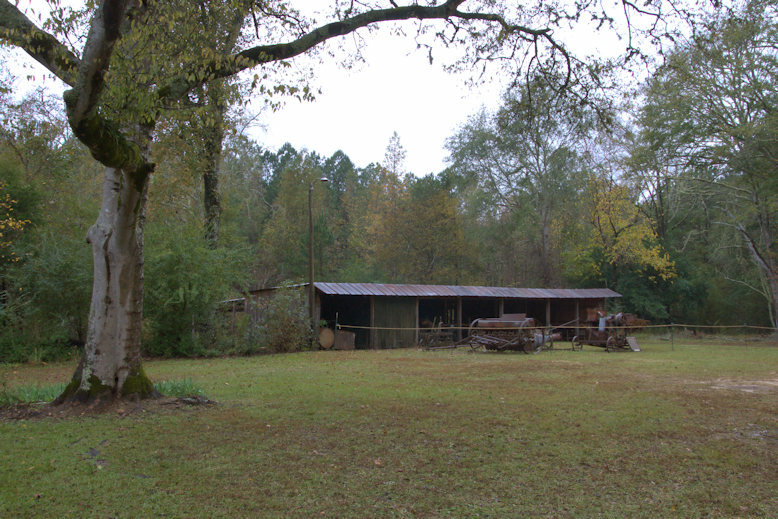 Regina and Louis began modernizing the farm by the early 1950s and this equipment shed allowed easy accessibility for tractors, bush hogs, and all manner of tools. 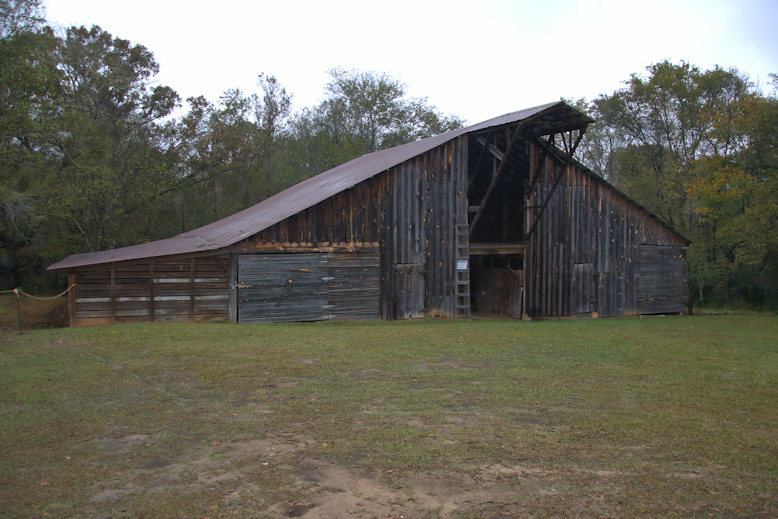 This barn sheltered the farm’s riding and working horses. On Mother’s Day 1962, Flannery gave Regina a Mexican burro named Ernest. 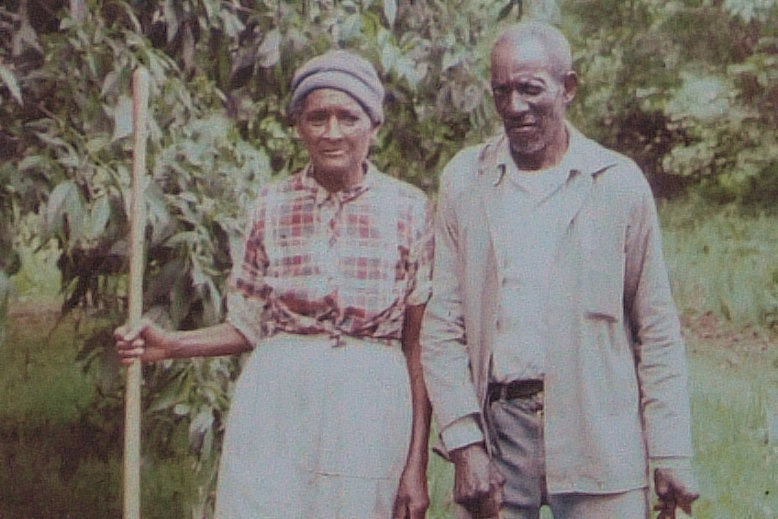 A female Sicilian donkey, a jenny named Marquita, was later added to the farm. In September 1963, Ernest and Marquita had a foal Regina named Equinox. In the early 1970s, Marquita mated with a pony and gave birth to a hinny named Flossie. A hinny is the offspring of a horse and a jenny. Equinox and Flossie were companions until Equinox died in 1998. Flossie lived out her days at Andalusia until her death in 2010, becoming a bit of a celebrity herself with visitors and journalists who covered the property. 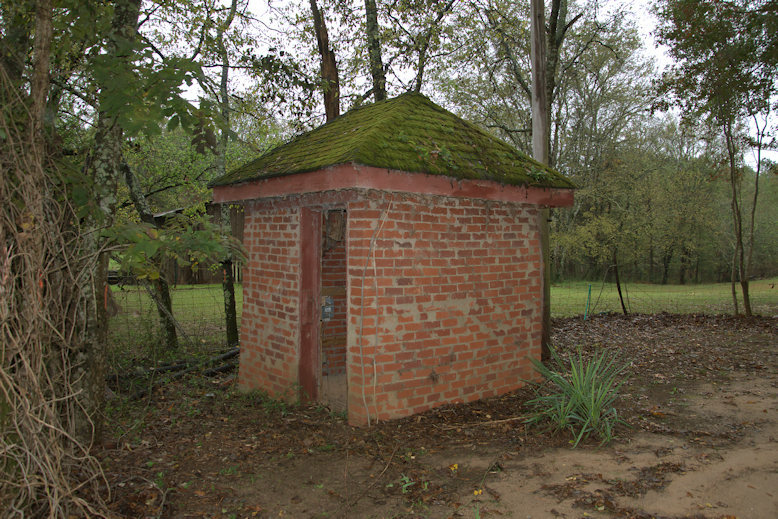 Though it looks old, the pump house is among the newest structures at Andalusia. 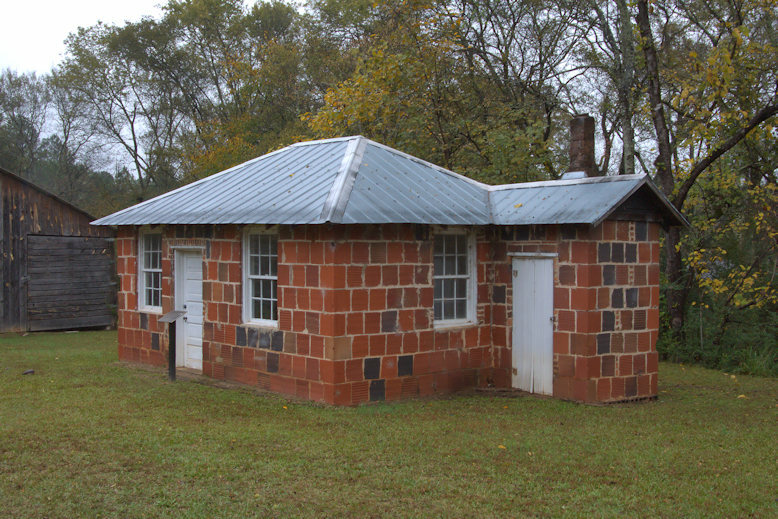 Just to the rear of the main house was a three-bay parking garage known as the Nail House. 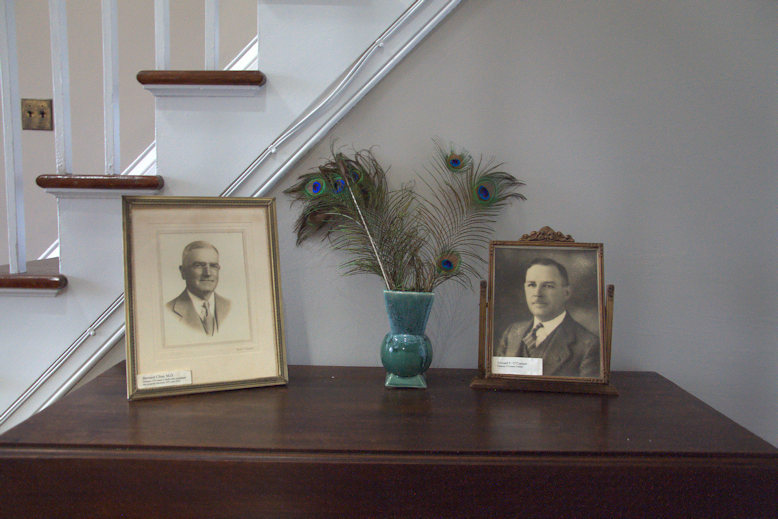 It became home to most of Flannery’s birds, including ducks, turkeys, geese, pheasants, and her beloved peafowl. Her first pair came from a breeder in Florida in 1952, and she would eventually have more than 40. 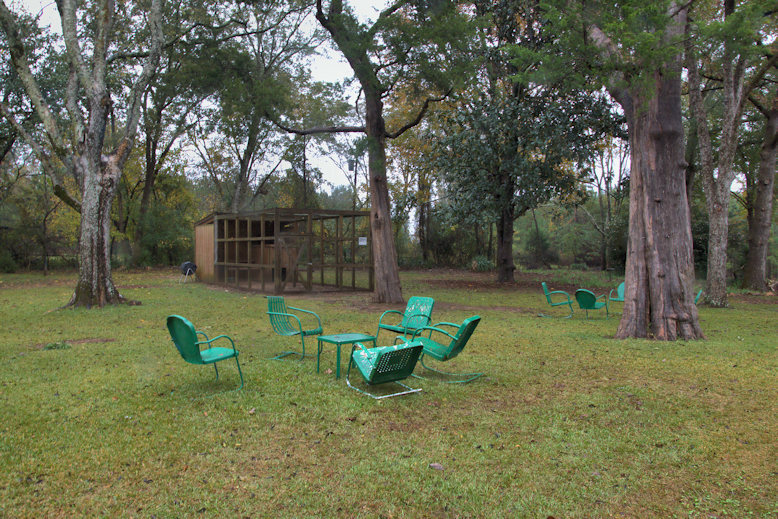 An aviary is presently sited to the east of the main house. 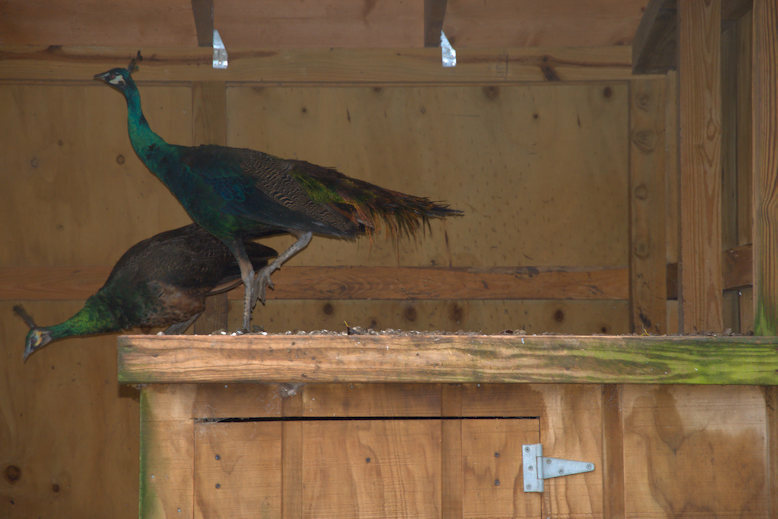 Of course, peafowl are kept on the property today. This pair was quite shy, though. 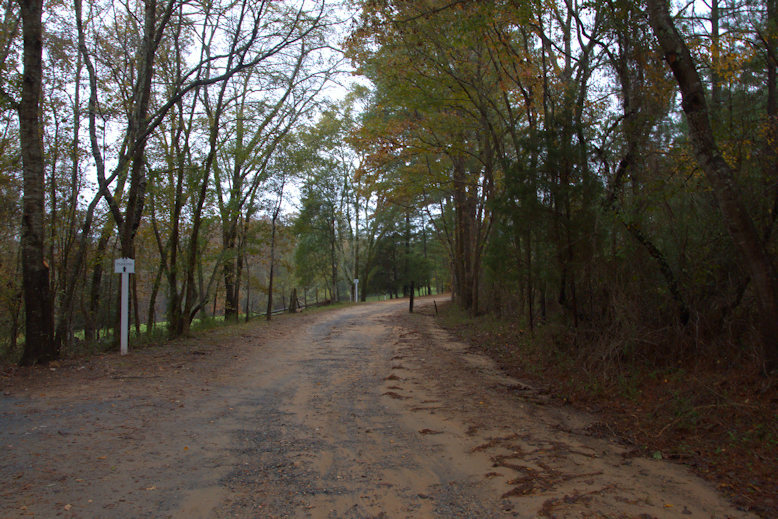 Situated north of the Fall Line, Andalusia is characterized by rolling hills and beautiful hardwoods. A tree-lined driveway leads to the main house. 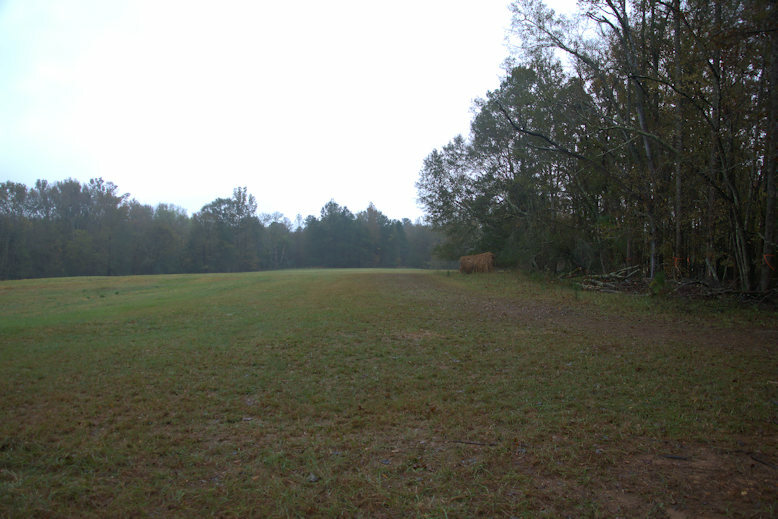 A large hay pasture is located just to your left as you’re driving in. It’s a beautiful space which I remember admiring from US Highway 441 in my college days. 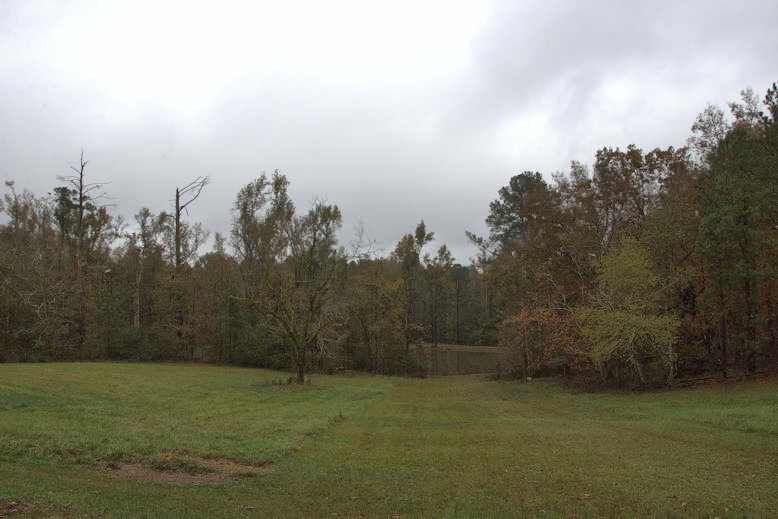 The view in front of the main house follows a gently sloping pasture to a secluded pond.